Brazilian Hair is light, silky and lustrous in texture which is one of the reasons that it's the most popular type of hair extensions in the market. The light texture of the Brazilian human hair makes it effortless to wear & maintain. 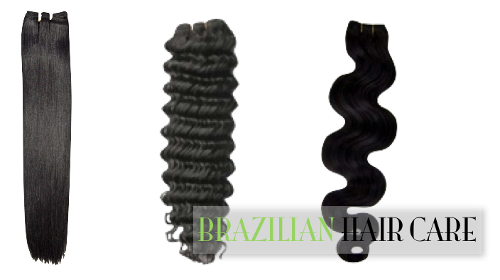 With proper care, Brazilian human hair will not mat or tangle and maintain its silky, luscious state. Now that you have received your Brazilian Hair you are likely curious how to care for it. Hydration both before and after installation is the most important step to maintaining the exquisite texture and appearance of your hair. Follow these tips and get ready for the compliments! Inspect: When you receive your shipment remove your product from the package and inspect each piece carefully. We take great pride in our product, and it is 100% guaranteed. Since natural hair is reactive to a simple wash and deep conditioning, you can keep your new hair looking its best by implementing a simple care regimen. Shampoo: Distribute a generous amount of Shampoo through your entire scalp and massage your scalp with the tips of your fingers (not your fingernails). Gently shampoo in a downward motion working shampoo from the top down. This rubbing action and the resultant friction will loosen dirt, product residue and dandruff which can then be rinsed away. Thoroughly rinse your scalp afterwards, still massaging with your fingertips as you do so. Condition / Hydrate: Conditioning the hair is vital to its maintenance. After you have shampooed and thoroughly rinsed your hair, apply a generous amount of Conditioner to the hair. Gently comb hair with a wide tooth comb, to assure even coverage. Rinse conditioner from your hair with warm water and gently towel or air dry. Mid Week Wash: Make sure to Shampoo your hair at least once a week. If you lead an active lifestyle, use excessive product or feel your hair had become dry substitute conditioner for shampoo during your weekly wash. Wash your hair in a downward motion, working conditioner from the top down in one motion. Please remember that many shampoos and conditioners contain harsh, drying sulfates that are extremely damaging to hair (ammonium laureth sulfate, ammonium lauryl sulfate, sodium laureth sulfate, sodium lauryl sulfate, etc.). These common detergents found in shampoos make curly hair frizzy and uncooperative. Conditioner can be used sufficiently to clean the hair (see the next step). Also, more gentle shampoos that contain mild cleansers (i.e. cocamidopropyl betaine or coco betaine) can be used occasionally or more often for wavier hair types. Pick an appropriate product for the care of your new hair. Use a good quality shampoo, your stylist can advise you what product is best for your hair. Styling: Always keep your extensions tangle free. Brush or comb gently and avoid any excess tension. Always comb or brush hair from the bottom up, small sections at a time. The more carefully you treat your extensions, the longer they will last. Support your attachment when brushing or combing your hair. Hair Care Products: Use a good (leave-in) conditioner to keep your hair soft. Avoid hair products that contain alcohol which can make the hair very dry. Also remember that many styling products can cause build up over time. It is recommended that a deep cleansing shampoo be used once or twice a month to remove build-up. Build-up can make the hair dry and can cause tangling. Use moisturizers to avoid this problem. Heat / Styling Tools: Heat is your hair’s biggest enemy. The more you use on it, the shorter the lifespan of your hair. Use heat in moderation. Do not use high temperatures. High temperatures can damage the hair, including permanently altering the hair texture. These are just suggestions as well as experiences dealing with Brazilian Hair. The Weave Express is not reliable for any damage to the hair. If you perm, tint, bleach or cellophane the hair, you do it at your own risk. We do not guarantee any hair that has been chemically altered. If you must chemically alter it, then be sure to do a test strand first. This will allow you to test how the hair will hold up to the chemicals. Please read the labels of all hair products carefully. Do not use any of the hair products recommended if you are allergic to the product or to any ingredient in the hair care product.